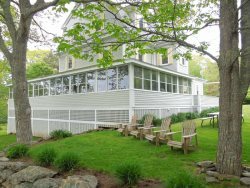 A treasured family home nestled at the end of Grimes Cove is waiting for you to settle in for a Memorable Maine Vacation! This Ocean Point Cottage is ideal for sunset watchers and communing with nature. Begin your day with the sunrise out on the deck while enjoying the soothing sounds of the nearby ocean. Take a walk down to Grimes Cove for an afternoon at the beach and end the day with quality conversation, seafood dinner or yard games as the sun sets. The cottage and grounds have been lovingly cared for by the owner’s family for generations. The memorabilia found on the walls and shelves are typical of this type of Maine cottage. "My great-grandfather and grandfather built a small cottage near the casino in the early 1900's. My mother and 3 brothers grew up there during the summers from then on. As she married and had 3 children, we spent the month of August with my grandparents. One of her brothers purchased his own cottage on the Shore Road and my Dad purchased the cottage on Grimes Ave in 1960. Over the years, I have met lifelong friends from all over the country who keep coming back to Grimes Cove. After many years of blood, sweat, and tears, the cottage was transformed into what we know today as Thankfulnest. We have been so blessed to own property on a quiet dead end street with a view of the ocean and access to the water measured in only hundreds of feet. A cove for swimming and boating is at the end of the street with a boat landing to launch if desired. The salt air smell and the pounding surf can be smelled, heard and felt as the ocean crashes on the rocks at the foot of the street. Many nights are spent on the rocks watching a meteor shower, staring at the stars or being in awe of the full moon's reflection on the ocean. Our grandchildren are playing on the same rocks, caves and swimming in the same tidal pools as my Mom, my siblings and I and my children did. It is a special place for folks of all ages and one that we are most thankful for. We look forward to sharing Thankfulnest with those that have a love for solitude, fresh salt air, the ocean breeze and being surrounded by God's creation. We look forward to your visit. Sincerely, The Alden/Eddings Family." THE HOUSE: The main floor consists of a fully equipped kitchen with breakfast nook, full bathroom, spacious living and dining areas with large picture windows. Curl up on the comfortable couch for movie night on the large flat screen TV. There is plenty of seating to accommodate the entire family! On the occasional chilly night, have a fire in the insert wood burning fireplace. Off of the kitchen is an open porch with a grill, table, and chairs for casual outdoor dining. Lobster and seafood are bountiful in these parts! The second floor is home to four bedrooms and a half bathroom with a washer and dryer. BEDROOMS: (1) Queen facing southeast w/ ocean views, (2) Twins- can be converted into a King- with partial water views, (1) Double bed with woodland views, and (1) Set Single-size Bunk Beds in washer/dryer room with woodland views. BATHROOMS: (1) Full bathroom with shower/tub combo, sink, and toilet on the first floor, and (1) Half bathroom with sink and toilet. PETS PERMITTED? Yes, dogs are welcome, but no cats please due to owner allergies. The owners have left two kayaks for guests to use. They can be launched from the boat launch at Grimes Cove at the end of the road. Grime’s Cove Avenue is a pine tree lined street on the Eastern most tip of the coastal community of the Ocean Point Colony. The rock-bound coast is 200 yards from your front door; easily accessed and great for walking, exploring, sitting, napping, hiding and seeking. The Shore Road winds along the coast for over a mile allowing one to throw a stone in the ocean at any point. The magical sunsets and gorgeous views make for unlimited "photo ops". Thankfulnest evokes a thankfulness for the natural beauty that is Mid-Coast Maine. Linen – Linens are NOT included, but, may be rented talk with your reservationist, pillows and blankets are included. Every staff member I spoke with was very helpful and friendly. They made the rental process really easy and stress-free. one of the most memorable, enjoyable, and relaxing vacations we have ever had!!! We require at least 72 hours’ notice of intent to rent so the cottage can be prepared for your stay. Swimming Area Rating: Grimes Cove Beach (5/5) is only a short walk away: very easy water access, sandy or pebble beach, great for all ages! Privacy Rating 3/5: Still in a quiet location, but one neighbor close by, little protection from trees, may be close to a road.